A weed is simply a plant growing in the wrong place, while a garden thug is a plant spreading without apparent limit, and overwhelming other plants it encounters. Garden thugs could well be landscape assets, given freedom to expand. Here are three examples from my South African succulent bed. Some 550 recognized species are included in the genus Aloe. One of them, the Soap Aloe (its sap makes a soapy lather in water) is among the most popular Aloe species in California gardens. The plant forms a rosette about a foot wide, made of pointed fleshy leaves about eight inches long. In the spring it sends up a two-foot long stalk topped by orange-red flowers in a flat-topped cluster called a raceme. So far, so good, but it also sends underground suckers that soon create a dense colony. I lifted ten plants for this month’s garden exchange, then put another eight in the green waste. 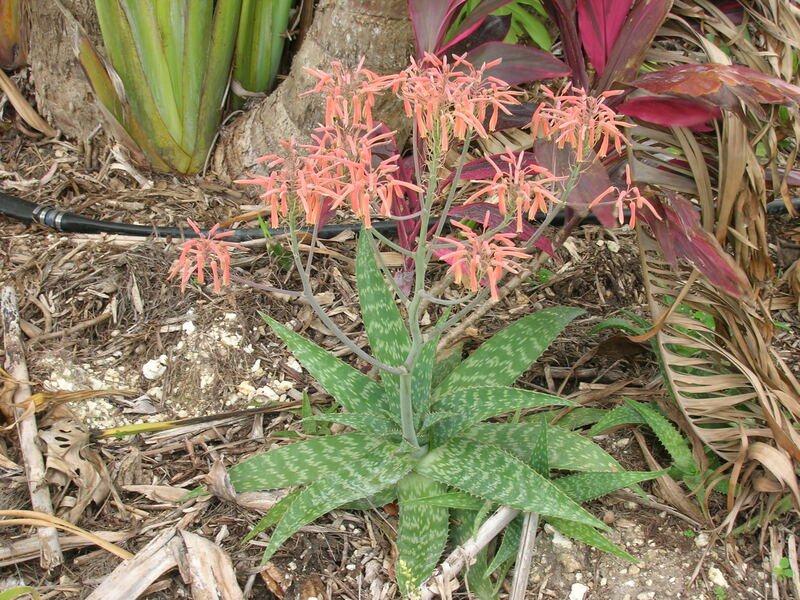 Related species in my garden include A. arborescens (Torch Aloe), also a vigorous grower; A. plicatilis (Fan Aloe), a slow-growing small tree; and A. ‘Christmas Carol’ (hybrid), a smaller plant with vibrant red colors in the leaves. In this group, Soap Aloe is the real thug. Senecio is one of the largest genera of flowering plants, with about 1,250 species that present many amazing forms. 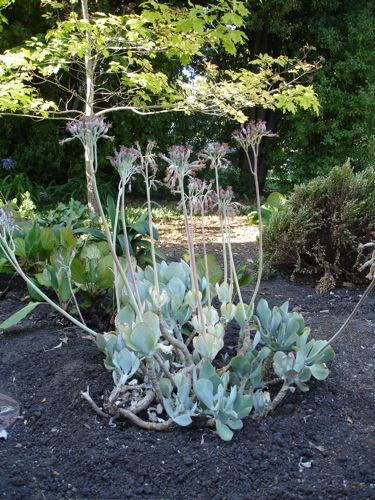 Blue Finger, which might be a hybrid, grows twelve-to-eighteen inches tall, with numerous four-inch long blue-gray leaves shaped like fat bean pods. It produces uninteresting white flowers in summer but the foliage is the main attraction. The leaves will drop easily from the plant, and root to form new plants. The spreading stems also quickly establish roots. A nice-looking succulent plant and a welcome addition to the garden, but one that needs regular whacking to keep it within bounds. My other Senecios are S. rowleyanus (String-of-Pearls) (showing the variability of this genus) and S. haworthii (Wooly Senecio). There could be other thugs in this large genus, but Blue Finger certainly qualifies. 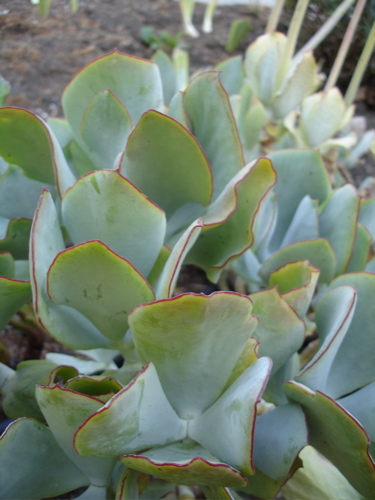 This striking succulent has gray-green fleshy leaves with red margins, and coral red, bell-shaped flowers on stalks in early spring. The leaves grow on stout branches growing any way other than straight. This attractive plant spreads over time, and is considered invasive in some parts of the world. The plant has medicinal uses, but its leaves are said to be toxic to livestock, poultry and dogs. It works well in containers, which might well be the best place for this plant. These vigorous plants will prove you have a green thumb, but they require control. This entry was posted in Essays 2014, Uncategorized, Winter Quarter and tagged Garden Thugs, low maintenance, Selection, succulents by tomkarwin. Bookmark the permalink.